Statistics reflect as many as 43 percent of women of childbearing age have experienced an abortion. For these individuals, abortion is not about political rhetoric, journalism, or feminist freedoms—it is about a life-changing choice made during a time of crisis that often leaves them facing unexpected emotions and unexplainable behaviors. A Surrendered Life is a faith-based healing journey for those individuals who have experienced an abortion, as well as for their loved ones. Through the transparent personal story of the author, along with men and women from around the nation, the healing has begun. Join Pat and her brave team of writers as she shares her powerful testimony and eight steps to freedom, healing, and hope for those caught in the trap of abortion. • Understand why so many women and men choose abortion. • Recognize the potential effects of a past abortion and symptoms of post-abortion trauma. • Examine what God says about abortion. • Discover eight steps to healing and restoration for yourself or someone you love. • Identify specific action steps that you can take today that will make a difference in your home, church, or community. 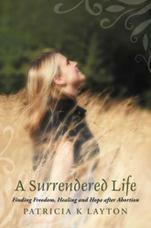 This book is a real story of healing and hope that can inspire every reader to begin A Surrendered Life.